The Orbea Alma H50 is an XC bike that delivers superb performance without breaking the bank. It’s a perfect entry into the world of mountain biking for any beginner. A lightweight triple butted and hydroformed alloy frame puts you in the perfect position to hit the trails confidently. 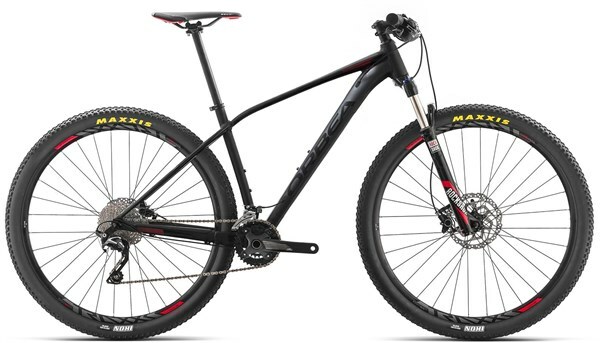 This hardtail will propel you up the climbs easily, while being capable in tricky terrain with the RockShox fork. The 27.5” wheels are quick to get up to speed and offer nimble handling. Alma is for the quickest lap times. The steepest climbs. Alma is for the strongest accelerations and highest altitudes. Alma is for the biggest stages, the loudest fans and the toughest riders. Alma is for the fiercest competitors, the athletes who accept nothing less than superlatives. When a few fleeting seconds separate fast from faster, Alma is for the fastest. 4x4 Dynamic Structure - External forces on the frame under the rider's weight - cornering stresses or vibration from impacts - have a large effect on control and traction. Creating a natural flex point in the top tube by adding a fourth bend offers an efficient, smooth ride that feels like floating over rough terrain. BWC - Instead of trying to squeeze everybody on a single wheel size, we offer Big Wheels that are scaled to fit riders of any height. BWC offers five frames in two wheel sizes - Small and Medium frames with 27.5" wheels, Medium, Large and XL frames with 29" wheels. World Cup Geometry - Refinements of Alma's World Cup Geometry reflect the evolution of elite racing. A slacker head angle (69.3/69.5 Degrees) provides stability on increasingly demanding tracks. A steeper seat angle and lower stack height increases handling and precision and pedalling efficiency. Shorter (420/430mm) chainstays deliver maximum agility without instability.